Goldseekers. Hunters. Trappers. Wanderers. Adventurers. Flee-ers. Seekers. Hundreds of thousands of pioneers emigrated westward along the California Trail in the early and mid-1800's. 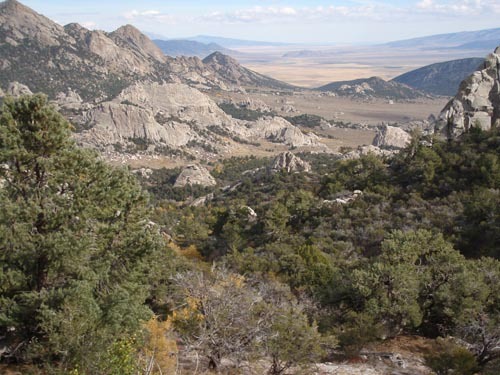 The northern branch of the California Trail passes through the old lands of the Shoshone and Bannock Indians, through what is now southern Idaho, and the City of Rocks National Reserve. 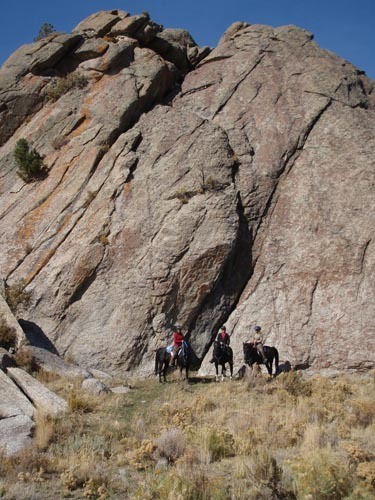 Between 1843 and 1882, an estimated quarter million emigrants travelled through the City of Rocks on this trail en route to the West. In 1852 alone, some 52,000 people passed through. "Passed some beautiful scenery, high cliffs of rocks resembling old ruins or dilapidated buildings." Dr. John Hudson Wayman - July 12, 1852: "This City is walled in on every side with towering granite mountains, some peaks shooting athwart the sky like towering domes. While hundreds of piles, peaks, steeples and domes, of all shapes possible in the distance looking like an old dilapidated City"
The Twin Sisters - 2 side-by-side granite spires, one of which is 2.5 billion years old, the other 25 million years old - have been significant throughout recorded human history. The peaks may have had important spiritual significance for the Native Americans. They were a significant landmark for the pioneers travelling the California Trail. Not named "Twin Sisters" by white people until 1848, there were 88 descriptions in 86 pioneer journals comment on them, including Steeple Rocks, Twin Mounds, Twin Buttes, Twin Pyramids at Gate, Two Dome Mountain, and Castle Rocks. The old California Trail snakes through the Circle Creek valley, surrounded by the unique granite formations that give City of Rocks its name. Emigrant Canyon, through which runs the old Salt Lake Alternate Emigrant Trail and the old Boise-Kelton Stage Route, spills into City of Rocks with a view of the Twin Sisters where it meets the California Trail. Heath Canyon climbs up and over a gentle pass that also drops down to the California Trail and a view of the Twin Sisters (see my stories of our rides over these other trails here). Perhaps the pioneers also used this new route we rode on Saturday. 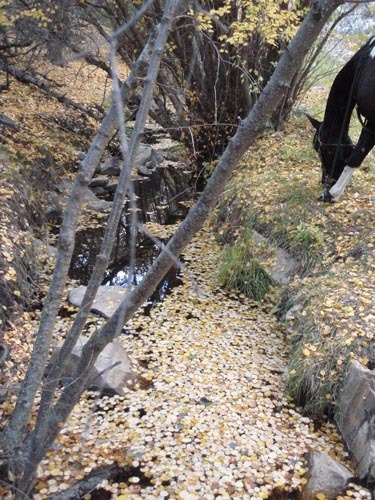 Maybe they travelled up the valley of Junction Creek, and turned off and camped at Sparks Spring and watered their animals like we did. Perhaps they picnicked and rested at this giant granite pinnacle like we did. Maybe they crested this unnamed pass and were amazed at the Twin Sisters that rose into view and guided them like a beacon as they descended to the Salt Lake Alternate trail, as they did for us. Maybe our awe matched their own. I hike back to the Wind Caves today to finish marking the Birch Creek trail for the Owyhee Hallowed Weenies endurance ride over Halloween.The big advantage of doing it on foot and not horseback is, I can explore the nooks and crannies of Wind Cave Canyon. Jose would have loved it, but he wouldn't have fit. I climb over and under and in and around the twisting labyrinthine canyon, squeezing between boulders, ducking under overhangs, skirting caves, scrambling up the smooth sandstone (? In one of my next lives I'm going to come back as a geologist), sliding down walls into deeper chambers - and hoping I can get out the other side, because I can't crawl up and over the walls. It must be spectacular in here in a heavy rainfall. I can imagine it, watching sheltered in one of the little caves above, as the water, racing the miles downhill from the Owyhee mountains, gathering speed and power and purpose, finds this wash and slams into this canyon, raging and squeezing through the narrowing rock walls in a violent clash, funneling roaring waterfalls, sluicing up sand and heaving it downstream, shoving boulders, swirling up the canyon walls, gouging out more hollows, caving in more of the walls, all of it whirling into the downward-racing maelstrom. It's not nesting season, but naturally I want to get a better look into the raptor nest tucked into this fine hidden grotto barred by big fallen monster boulders. If I scramble out one canyon entrance, I can crawl under another one and get in on the backside of the boulders, crawl up onto them and stand on my tiptoes and look in. This area is accessible by ATV, and there are numerous campfire rings in the canyon (fortunately, not too much trash!) - one in an overhang at the mouth of this canyon entrance - it's rather surprising a raptor uses that nest. I stand on my tiptoes and I stare at the nest at eye-level from 30 feet away. I turn back around and look down at the boulder I am standing on, and find part of a pellet, and a little rodent skull - raptor food. And suddenly, I feel it - I lift up my eyes and am looking straight into the golden eyes of a Great Horned Owl, staring at me camouflaged from a dark notch back in the canyon wall. Unperturbed by my presence, she sits motionless and relaxed, blinking unconcernedly at her unexpected visitor. In fact, when I look on the entire sand floor of the grotto below my feet, it is littered with months - years - decades - of tiny bird and rodent bones, and a few feathers, including this Great Horned Owl feather. And that's the thing about the hidden Owl Grotto in the hidden Wind Caves in the vast Owyhee desert. Few people know the Wind Caves are hidden in there, fewer people know the Owl Grotto is hidden inside the Wind Caves, and even fewer people who make it into the Owl Grotto know they're being watched. Fine by me and the owls. I nod my respectful thanks for the unexpected encounter, and say goodbye, and slip out, leaving her to her secret Owl Grotto. He didn't look like much, just a laid back, plain, skinny and rather slight 14.2-hand bay gelding with a big scar on his shoulder. He didn't act like much, especially in the vet checks of endurance rides. "After he had a bucket of water poured on him, he could look like a drowned rat!" recalls endurance competitor and arch-rival Hal Hall. "In vet checks, he'd stand with his hip cocked, his head down 5 inches off the ground," says Ann Hall, Hal's wife. "You'd think, 'This is the day Donna and Witezarif will get beat!' But as soon as she got on him, his head would go up, his tail would go up, and they roared out of the vet check." Witezarif most certainly - at least on looks alone - didn't leave an impression that he would become one of the greatest endurance horses ever to look through a bridle. He and his partner Donna Fitzgerald dominated the 100-mile Tevis Cup and the Virginia City 100, and other rides in the 1970's. The pair won Tevis six times, four of them in a row - a record that is unlikely to ever be equaled - and finished second once by one minute. Witezarif won the Virginia City 100 six times, five of those with Donna, and finished it 11 times. With all the unparalleled achievements, and the unbridled accolades from defeated rivals, one might expect that Witezarif and Donna suffered from a superiority complex. They didn't. Donna, rather shy and reticent, is quite matter-of-fact and unpretentious about her success with her extraordinary partner Witezarif ("Witez" she called him). "She was quiet and unassuming, but a MONSTER on a horse," Hal Hall says. "She was not demonstrative, very polite. If you saw her walking down the street, you wouldn't think she was competitive." To this day, Donna doesn't sing her horse's (or her own) praises, and she downplays their impressive accomplishments. 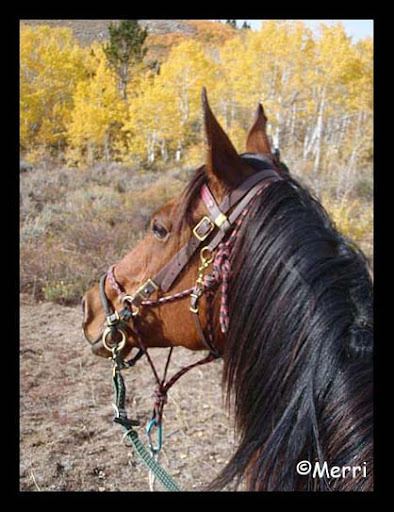 Other than wearing a Tevis buckle at a very rare appearance at the Tevis or Virginia City ride, you still wouldn't get a hint that she was a one-half of a Legend. Witezarif himself was rather aloof. His personality was, Donna says quite simply, 'Let me do my job.' "He wasn't a particularly friendly horse," Donna says. "He did kick me a few times." Once was when she tried to show him for Best Condition after finishing a ride. "He didn't show well for the vets - he couldn't lead, he'd drag back behind me," Donna remembers. "At the time I didn't know how to teach him to trot beside me, so that's what we went with. Once I tried slapping him in the stomach to trot out beside me, and he kicked me!" 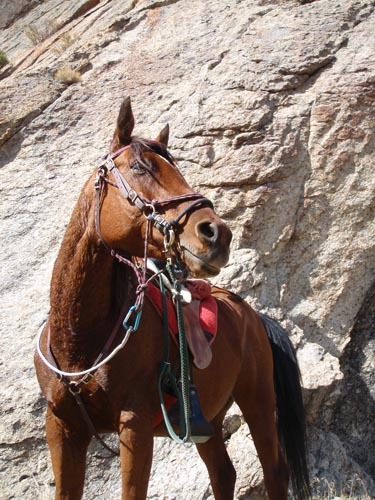 Another time during Tevis, riding along a cliff above a canyon, Donna and Witez were riding by themselves in front, and he spooked. "His hind end went over the edge! I bailed off him - I rode him in a halter in those days - and I pulled him by his halter back onto the trail. Then he bolted past me and kicked me, and ran on down the trail. "I wasn't hurt," Donna continues, "and was afraid he'd go run off a cliff, or I'd never see him again... but there he was at the bottom of the next hill, waiting for me, and he nickered at me when I came up to him. I got back on him, and off we rode." They won Tevis that year. He kicked Pat Fitzgerald, Donna's husband, for good measure once, too. He was moving horses around a corral in the mud one day. "His legs got stuck in the heavy mud, and Witez ran past him and kicked him just to do it. It broke Pat's knee." Foaled in 1963, Witezarif came from Hyannis Cattle Company in Nebraska. HCC horses were mainly Crabbet/Kellogg Egyptians Arabians crossed with Polish breeding. They were known for being rugged, and for possessing good legs and good bone, strength, and stamina. "Endurance riders got the culls from the cowboys," Hal Hall says. HCC was a 'mom and pop operation' back then, and if you could get one of their top picks, "they were the cream of the crop." Hal would know - one of the HCC horses he obtained, El Karbaj (a younger 3/4 brother to Witezarif), won the Tevis Cup twice - defeating Donna and Witez in 1974 by 1 minute - and the Haggin Cup (Tevis Best Condition) twice. Around 1967, Pat Fitzgerald had gone to get a horse from HCC's neighbor, Rushcreek Ranch - also known for their rugged, well-bred Arabian endurance horses. Ted Jerry with HCC, a friend of the Rushcreek Ranch, told Pat he had a horse for him to look at. Pat could take him home and use him, or sell him. Pat took him home and tried him and kept him - it was Witezarif. By Witezar, a son of Witez II, and out of Razifa (by Zarife), Witezarif has the classical Desert Bred, Egyptian, Polish, and CMK (Crabbet-Maynesboro-Kellogg) lines in his pedigree. In addition to dual Tevis Cup winner El Karbaj, Witezarif's dam Razifa also produced AERC National Champion Law Thunder. Donna recalls Witezarif was 4 1/2 or 5 years old when Pat bought him. The AERC (American Endurance Ride Conference) didn't start keeping computerized mileage records until the 1980's, but Donna remembers that Witezarif did his first endurance ride in 1968, at 5. He also rode in and completed his first 100-mile rides that year, including his first Virginia City 100, with Louie Henderson riding. "When he was young," Donna recalls, "he was spooky, but after he did a few rides, he was quiet, and his energy level would come down. He almost fell asleep on the trail!" Maybe that was Witzarif's strategy for his winning ways. Or, perhaps it was the work he did when he wasn't on an endurance ride. Witezarif wasn't treated like a big star - he worked, along with his stablemates, including Pat's Tevis horses, in a trail riding stable that Pat and Donna ran in the mountains in South Lake Tahoe. Only Donna rode Witez, though. All the horses worked every day in the string and were typical of plodding horses you find at some dude ranches. "They were like all the other horses in the dude string after a while - people couldn't make them do anything!" 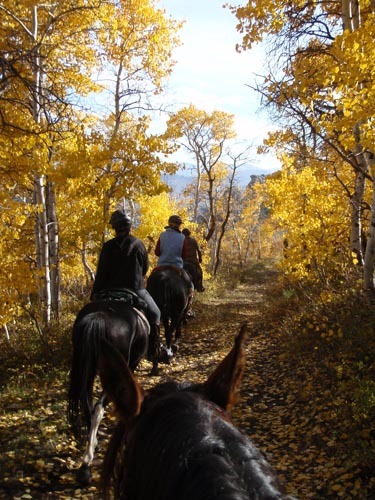 The trail riding was all walking, up and down the steep hills around South Lake Tahoe - a practice many modern day top trainers employ for their endurance horses now. In the afternoons, Donna would take Witez out for more training, and they'd trot. "I'd go up every hill I saw, and we had some big and steep hills." One of her favorite training rides was a loop up to the top of Hidden Valley and back, about 20 miles. There was no special feeding program, there were no special supplements, electrolytes, or balanced feed rations for Witezarif or the other horses. "In the winter we fed the string alfalfa and half grass, no grain. In the summer they got straight alfalfa, good hay, and grain - and that's because they worked. if they didn't work, they didn't get the good stuff." All that work - walking all day every day, then training on those steep hills was surely one of the reasons for Donna's and Witezarif's momentous success at Tevis. 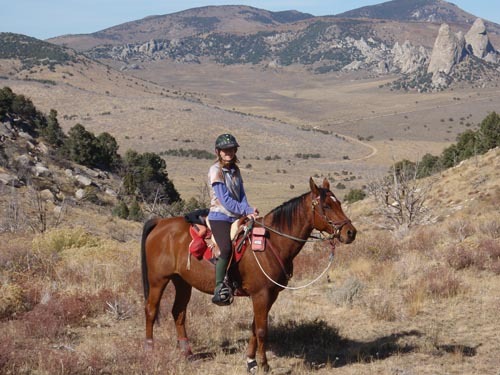 Tevis is known as one of the toughest 100-mile rides in the world. 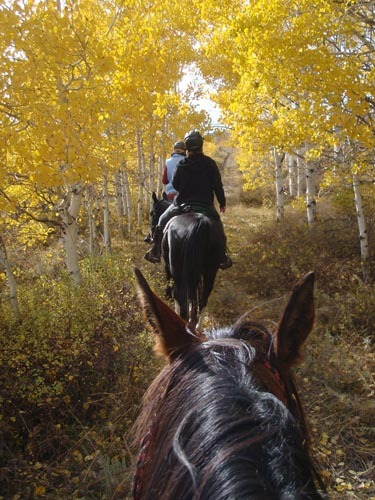 It is the ultimate challenge for a horse and rider team: riding in the dark, and daylight, and likely dark again, intense heat, hazardous trails, 19,000 feet of climbing and 22,000 feet of descending. And you’re crossing the Sierra Nevada mountains: temperatures can range from below 40* F in the morning to 120* F in those steep canyons in the afternoon. 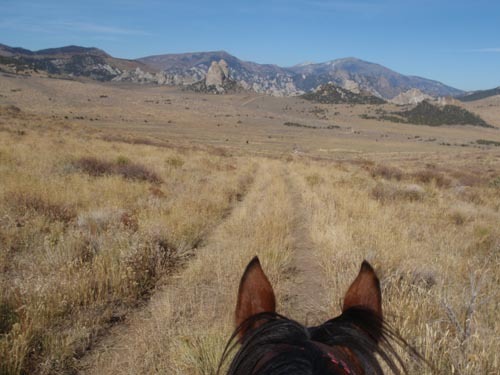 Much of the trail passes through inaccessible and rugged wilderness, reached nowadays only by foot or horseback or helicopter; so for much of the ride, if anything unexpected happens, you are on your own. Many miles of the Tevis trail are along cliffs with a thousand-foot drop below you. You and your horse need to be fit, and you'd better know each other. Even so, your chance of completing the ride is just over 50%. The starting line is near Truckee, California and ends in Auburn, California. You have 24 hours to complete the ride; winning time varies when parts of the trail have to be re-routed, but averages around 12 to 14 hours. A statistic once concluded that half of the finishers cross the finish line with less than an hour to spare. It's a difficult ride for the typical Tevis horse and rider, but Donna and Witezarif made it look so easy. "They were virtually untouchable over the years at Tevis," says Hal Hall. "They were Fearless. No Fear. That's how I'd describe both of them. To keep up with them was a bit of a chore, to put it mildly - but I finally figured it out. "The Tevis trail's very technical, lots of descents and climbs." Hal laughs as he recounts his vision of Donna and Witezarif. 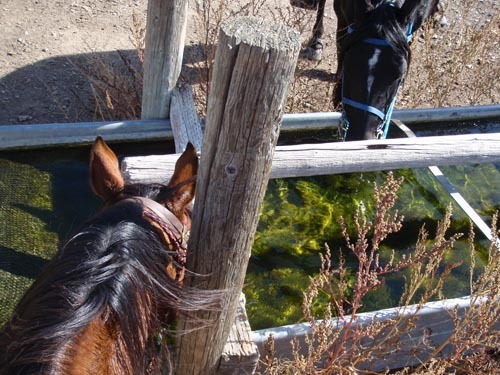 "She and the horse - I distinctly remember - would pass me at a gallop, on single track switchbacks - and these are old mining mule trails - down into the canyons, where one misstep - one step off, and off the mule train would go. Donna'd gallop past me, without hesitation. I could hear them coming - and i finally learned to get out of the way, ride my own race and not try to keep up with them." In the 1972 Tevis Cup, Hal had the lead at 90 miles. "At the American River crossing (the same one used today), I looked back and saw a cloud of dust. I was hoping it was just the evening angle of the light and haze... but no, it wasn't haze. It was Donna and Witezarif, galloping all out. She beat me that year by 1 minute. "I learned to take advantage on the uphills. Witezarif was a rather long, lean, narrow-faced horse - did not look like much of a mountain horse. He and Donna took every advantage of the downhills - and I'd catch her near the top of the canyons and hang on to the end. Witezarif wasn't an uphill horse, he was a downhill horse." Ann Hall agrees. "Witezarif would canter down hills. Donna had to have nerves of steel to do that! She must have had tremendous faith in the ability of that horse. And I think she was a good rider." Donna herself sums up their Tevis success quite laconically as, "Sometimes I'd gallop down the canyons in Tevis." Witezarif was also great at going over Cougar Rock (which riders can now choose to go around). 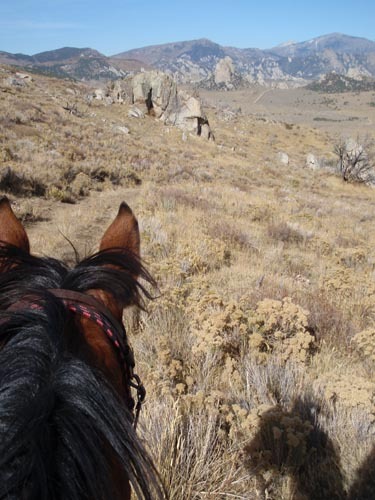 She didn't realize how good he was until she rode other horses over Cougar Rock. "Some of them scared me and I was afraid they'd fall off it. Witez - He'd go over it like it was nothing." Other horses and his placement in the ride made no difference to Witezarif. "He could be behind other horses, he didn't care about other horses, sometimes he followed for miles then passed. It didn't matter." When it came to the Virginia City 100 around Virginia City, Nevada, Hal Hall concedes total defeat. "Witezarif and Donna dominated Virginia City. I could never out-do her on that ride - it was her home turf." Witezarif won the Virginia City 100 six times, five of them with Donna riding. He completed the ride 11 times, the first time in 1968 at age 5 with Louie Henderson riding. Australian Sue Scantlebury rode him to a tie for the win in 1969 (he also received the Best Condition award); Donna finished on him in 1970, 1971, and 1973. Then the winning streak began. The pair won the ride the next four years in a row. They finished again in 1978, and Witezarif earned his 1000-mile Virginia City blanket, one of only four horses to ever do so. Witezarif returned to Virginia City one more time, in 1980, at age 17, finishing the ride once again with Debbi Early riding. The only 'blight' on his record - if one has the cheek to call it that - is that for all his wins, Witezarif didn't win many Best Condition awards. But there's a likely explanation for that. Back then, BC judging didn't take into account the modern-day factors such as weight carried, CRI (cardiac recovery index), and finish times; it just depended on the judges' opinions of how alert and animated the horse was when he trotted out. Had the modern scoring system been used, Witezarif might have racked up a few more of those awards. While Witezarif was known for acting half asleep during his trot outs in vet checks and Best Condition judging, his recoveries and pulse were known to be "phenomenal in any kind of weather and over all types of terrain." Witezarif retired from endurance riding around 1983, age 20. Donna rode six 50's on him that year. "I'd decided he'd done enough; it was time to retire." His career mileage record on AERC is listed as 5044 miles. Asked if he missed the endurance trails, Donna said she didn't know. "He had other horses to hang out with." AHA records indicate Witezarif died on May 31, 1998, although Donna remembers that he lived to be 37. "He hurt himself when he was about 35 - he was turned out with other horses, and one night I kept hearing clanging outside, but I didn't get up. Finally I did - went out at 3 AM in the ice, and dark; the ground was frozen, and Witez had fallen with his feet under the cattle manger, and he couldn't figure out how to get himself out. I pulled on his tail, and because it was icy, I was able to slide him out from underneath the manger. But he'd been down so long it hurt his hip, and from then on, he had problems with it. He did figure out how to roll and get back up; he'd sit like a dog, push up with his good leg." Just as she almost understates her fabulous success with her phenomenal partner, Donna doesn't make a big deal now of Witezarif's passing, nor of her and Pat leaving their riding stables in 1978, nor of their retirement from endurance riding; she's just pragmatic. "Other things came up." Witezarif was the AERC's first equine Hall of Fame honoree, in 1975. Donna Fitzgerald won the Hall of Fame award in 1978. Did Witezarif know he was special? "I dont know about that," Donna says, "but he did seem to like the attention." I asked Hal Hall if he thought we'd ever see his like again. "I don't think it will happen again. He was truly remarkable. "Today, people ask What If... Would Donna and Witezarif hold their own against (former multiple World Champion endurance rider) Valerie Kanavy, in international competition? And I think that they would. I saw Donna on less mountainous country, on 50 mile rides, and she shined." Their hoofprints have faded away, but their memory and records and Legend shines on: the Fearless rider and her Freak of a horse, one of the greatest teams to ever ride down the endurance trails.